When your 4-year old daughter still drags around a crocheted baby blanket made by a sweet friend (who was also her and her brother's well-baby nurse in the hospital right after they were born), it's only fair to return the favor to said friend with a baby quilt for her soon-to-be born baby boy. 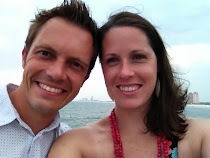 She and her husband were going through the process of adopting baby C#3, when they found out they were pregnant. The adoption process has been put on hold for the time being as they get ready to welcome this surprised addition to their sweet family. This baby is going to receive all the lovely hand-me-downs from his 2 older siblings, but he will have a blanket that is all his own. I dug into my stash and found different shades of blues and greys that coordinated well to make up the airplanes. The airplane templates were created from clip-art images found online. 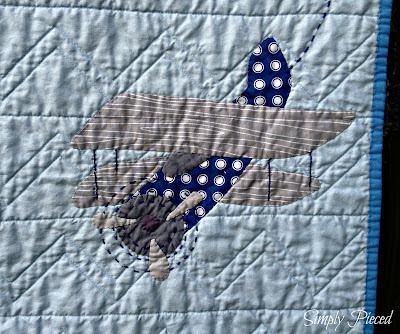 I used cross-stitching thread to create movement in the propellers and make it look like the planes are flying/flipping through the air. 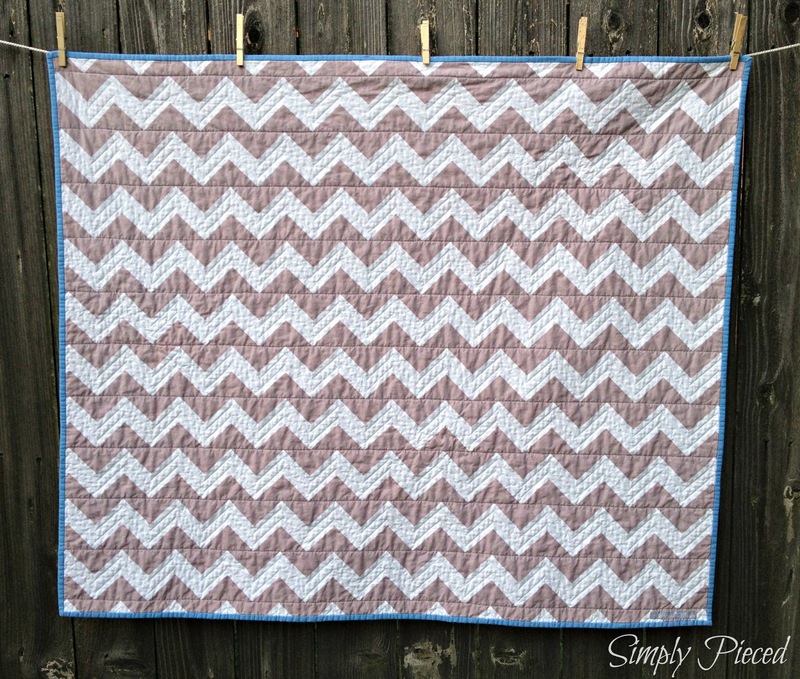 I used a large gray chevron print for the back and echoed the chevron for the quilting. 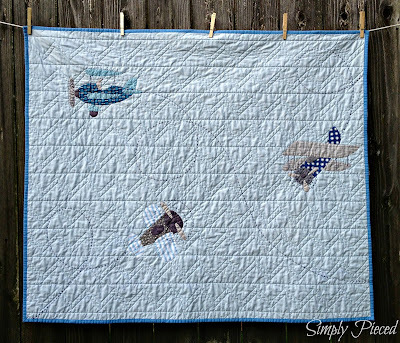 This was a fun quilt to make, especially when piecing together the airplanes and watching them come to life. Awesome! Great idea ... it would look awesome in my grandson's room! Thanks for sharing! Yay!!! I'm so excited to see it all finished, Janet! I'm sure that A loves it! Wow. This quilt is so fabulous. 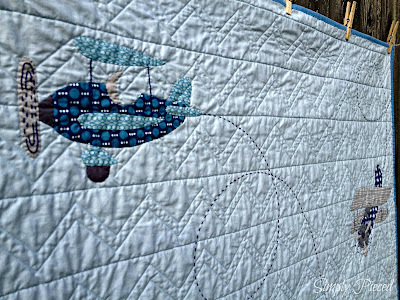 I love the real sense of flying you have managed to convey through the placement of the planes, the negative space and the quilting. Amazing stuff. 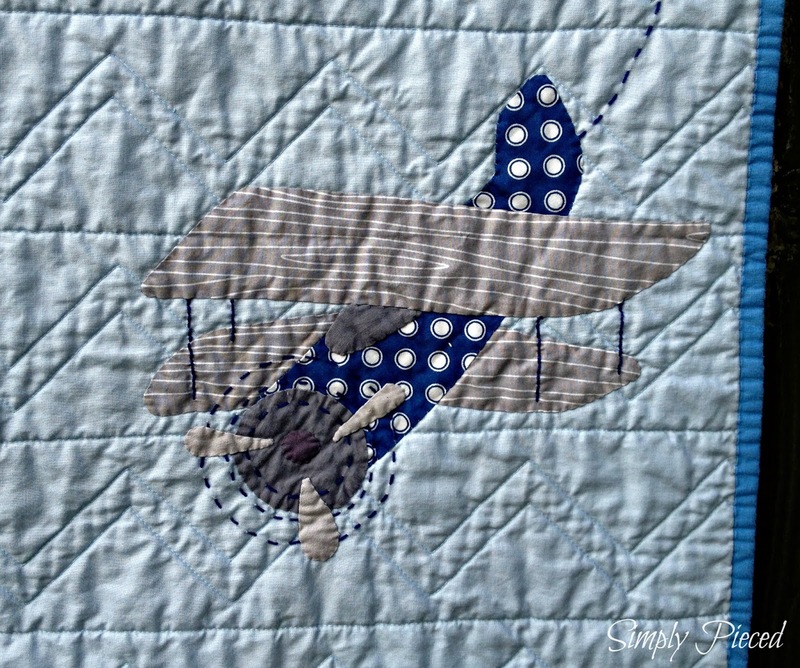 Love the airplanes on this quilt! It is just so adorable! Great finish! Beautifully done and a beautiful reason to make it! 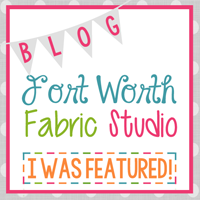 It's a beautiful quilt with a beautiful story! Adorable! I love the embroidered propellers. Yay for original designs! The planes are darling. 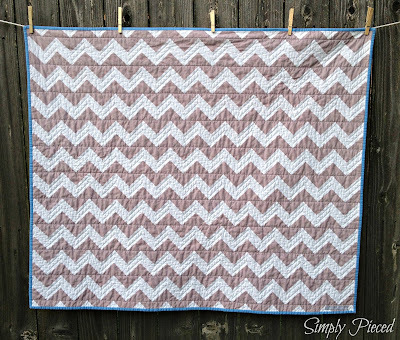 I especially love how the chevron quilting looks on the front in all the empty space. I bet your friend will love it! So cute! I love the quilting. Best airplane quilt I've ever seen. Really nice job. This is beautiful! Enjoyed seeing your quilt so much! Love it! How creative; and perfect for a baby quilt!! 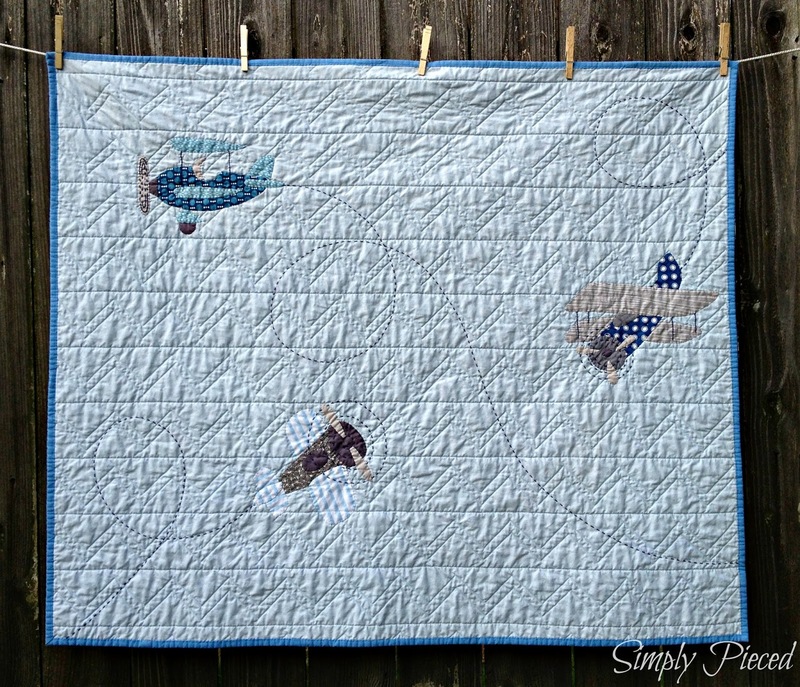 What a cute (and perfect) baby quilt! That is wonderful! 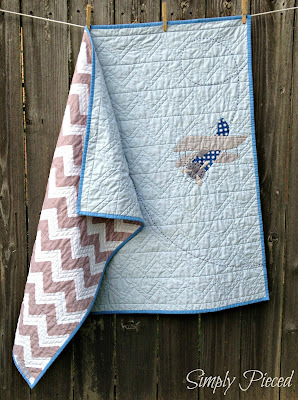 I love seeing the unique baby quilts people come up with. The hand quilting is perfection! Love it. What an extremely thoughtful quilt! 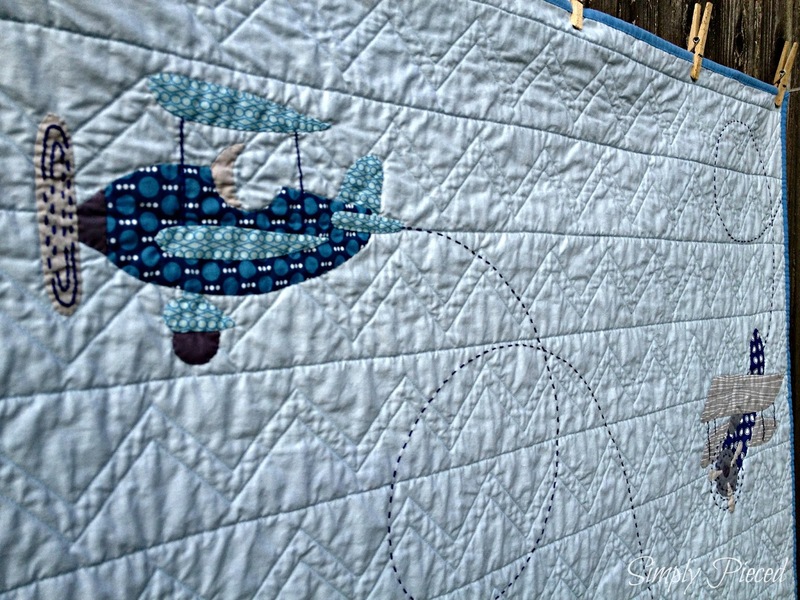 Love the planes and the quilting. Ooh! My boys would have loved this! 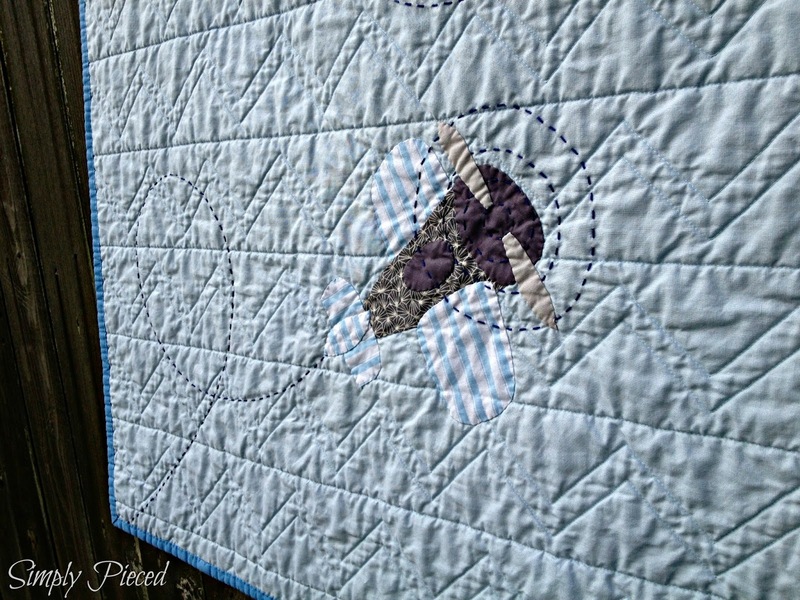 Perfectly pieced and quilted! What a beautiful quilt. I love that baby #3 gets his own special blanket designed with such care and love. What a sweet quilt and your friend will love it! Thanks for sharing.